It commences as 1849 comes to an end - with a disappearance that frightened and alarmed the people who lived alongside the Charles River; with Boston to the south, and with Cambridge on the north bank. One of the leading figures of Boston society, one of the so-called Boston Brahmins, was no longer to be found. Doctor George Parkman (who had long since given up the practise of medicine in favour of collecting and living off his rental properties), was that missing man. As he failed to appear at the doors of his properties his tenants would have sighed with relief that no rent had to be paid that week: this was a society where (admit it or not), money was tight. The eventual discovery of Doctor Parkman would reveal a deeper and more hidden problem of small incomes and rising debts, as everything came together at the Harvard Medical School. Harvard University had long been a home to theology and the humanities, but it also had that Medical School, which in turn had knowledgeable staff. What the staff lacked, though, were incomes that could support the middle-class lifestyles they were expected to lead. Across the Atlantic, Oxford and Cambridge were just allowing their faculty to move out of college and marry – they seem not to have had such financial pressure on individuals. Social pressure on academics in the Land of the Free meant that something had to give. In the case of Professor John Webster something did give, though what had happened did not become clear for some time. Following great developments in forensic science, Doctor Parkman’s body was found in the basement and laboratories of Professor Webster – in sections. Not every Body-Part could be found or identified as belonging to the missing man. Other parts had been yoked together after death – a hollowed torso had been stuffed with a thigh, like a grotesque roast. It seems that Webster had dealt with his enormous debts to Parkman in his own way. When Webster came to trial there were two problems: identifying the body parts as firstly they were not complete, and secondly, making it difficult in proving (beyond reasonable doubt) that Webster was the killer. Webster, while on remand, had started a rumour flying that his laboratory assistant, Ephraim Littlefield, was the murderer. While in court it was suggested Littlefield was motivated by the reward money. Finally, though new sciences such as forensic dentistry – a jawbone and teeth could be matched to the missing man – overcoming the doubts raised by the defence. (Several defence lawyers declined the case because they had concluded that Webster was guilty). Some questions remained, but the guilty verdict was unanimous. 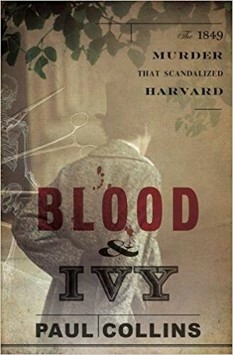 The newspapers followed the case in detail as it developed, and according to Paul Collins in this new full account of the case, the newspaper coverage spread first across Massachusetts and then all of the USA. It even reached Great Britain where one man following the case was Charles Dickens. Dickens had met Dr Webster during an earlier visit. When he returned in 1868 he demanded to be taken to the fatal rooms in the Medical School (which were left untouched until the building was demolished just before the First World War). If Collins is correct, then the disappearance of a burgess in a respectable town inspired the last strange death that Dickens was to turn into fiction, The Mystery of Edwin Drood. This is not the first book to deal with the Parkman-Webster murder, as an earlier account made much more of Ephraim Littlefield and the reasons why suspicion fell on him. Some of the features re-appeared in England in the Constance Kent case (which also inspired elements of Edwin Drood). After finishing Blood & Ivy, readers may want to revisit Kate Summerscale's The Suspicions of Mr Whicher which shares a macabre view of historical murder.